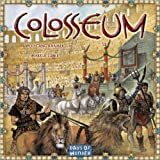 In Colosseum you act as a Roman impresario - producing great spectacles in your arena in the hope of attracting the most spectators to your events. You'll earn wealth and glory for each event you run, using it to build ever more ambitious events. Attract the most spectators to one of your events and you'll be granted the title of Grand Impresario, with tales of your extraordinary spectacles acclaimed throughout the empire. Place the game board in the center of the table. 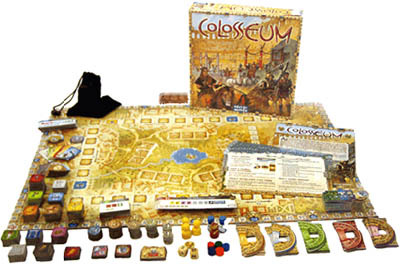 Prior to playing for the first time, punch out all the Roman coins and place them alongside the board. These make up the public bank that will be used throughout the game. If it is a 3 or 4 player game place the one remaining green back token face-down next to the board. Then Place the orange back Event Asset Tokens in the bag next to the board. The starting position of each player's Arena changes depending on the number of players. 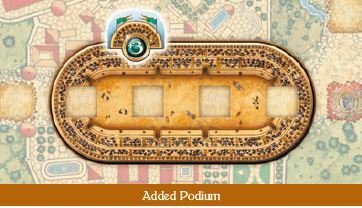 Place the Arenas on the board in the positions indicated in the illustrations on the right for the number of players in the game. Place the Emperor, the 2 Consuls and the 3 Senators on their respective starting positions (the colored squares on the path) 6. Their starting positions are also used as resting areas to make traveling less of a burden. Each of the squares represents a step upon the route traveled by these Nobles as they visit the different arenas. Take the Event Programs that are numbered from 1 to 5, mix them up, and hand out one to each player. Repeat this distribution with programs numbered from 6 to 10. Each player should have 2 programs in hand - one with a number from 1 to 5 and one with a number from 6 to 10. If there are any Event Programs numbered 1-10 remaining, remove them from the game. The object of the game is to produce extraordinary events that attract the most spectators to your arena. More spectators attending your events will bring you additional wealth and glory. The money you earn will help you acquire new assets such as fearless gladiators, powerful lions and magnificent horses that you will use to produce even more glorious events during future turns. 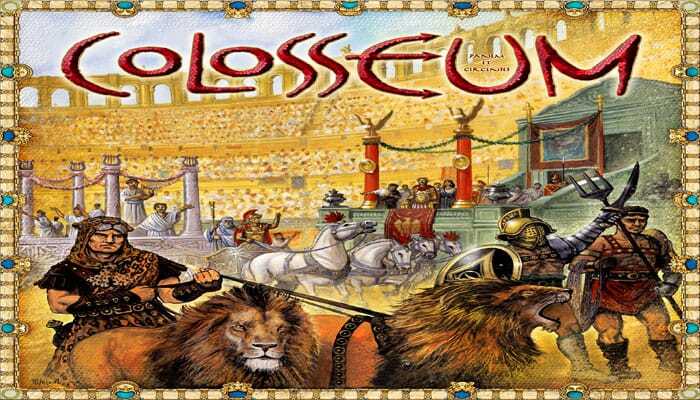 However, to produce these more ambitious events you will need to improve your arena by adding new expansions, purchasing Season Tickets, or even building an Emperor's Loge to make your arena more inviting to him and the other Nobles. During the game each player will have the opportunity to produce up to5 events. The player that attracts the highest number of spectators to anyof her5 events is declared the winner. Each phase is optional; a player can pass without doing a specific phase. On the first game turn, the player whose arena is immediately to the left of the Emperor takes the First Player token and begins by performing her Phase 1 actions. Proceeding clockwise, each remaining player then completes his or her actions in the first phase. Once all have completed a phase, the starting player, then begins the next phase. Play continues with each player having an opportunity to participate in each phase before the next phase begins. At the start of each new game turn, the game turn counter is moved to the next position. The player immediately to the left of the starting player from the previous game turn takes the First Player token and becomes the new starting player. The game ends after phase 4 of the 5th game turn. Note: While a player is normally limited to making only one investment during each turn, she may make an additional investment by turning in 2 Emperor Medals. See the Emperor Medalssection, page X. At the beginning of the game each player received 2 Event Programs. To create more ambitious programs, players can purchase additional programs during the Investment phase. The new program they purchase must have a higher number than the previous one they have produced. The Event Programs provide the information needed to create an event, including its cost in coins that must be paid to the bank immediately; the size of arena and the type and number of assets required to produce it; and the potential number of additional spectators it could attract when performed, depending on how complete the performance is. The following illustration shows you where to find all the pertinent Event Program information. To produce some of the more ambitious events, a player must invest to expand her arena. To purchase an Arena Expansion, a player pays the value of 10 coins to the bank and receives an Arena Expansion piece. 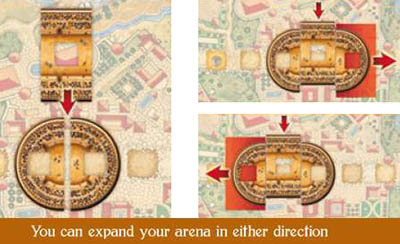 At the player's option, the arena can be expanded in either direction. At the start of the game each arena occupies 2 squares on the route. After the first expansion an arena encompasses 3 squares. An arena can be expanded twice to include as many as 4 squares. However a player can only expand once per turn (unless spending 2 Emperor Medals to make a second investment. See Emperor Medals). Players may also invest by purchasing a Season Ticket which ensures 5 additional spectators for each up- coming event. To purchase a Season Ticket, a player pays the value of 10 coins to the bank. 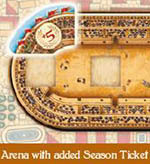 Place the Season Ticket in your arena. While only 1 Season Ticket can be purchased per turn (unless using Emperors Medals to make a second investment) a player can add multiple Season Tickets to an arena as long as Season Tickets are still available. Having the Emperor (or a Consul or Senator) in your arena is always an honor. Constructing an Emperor's Loge will increase the chances of attracting these luminaries to your events. To construct an Emperor's Loge pay the value of 5 coins to the bank and add it to your arena. 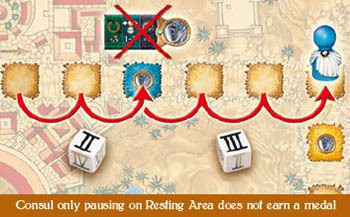 Having an Emperor's Loge gives the player the ability to roll 2 dice, instead of 1, when producing the event (see Producing an Event, page VI). An arena can only have a maximum of 1 Emperor's Loge. 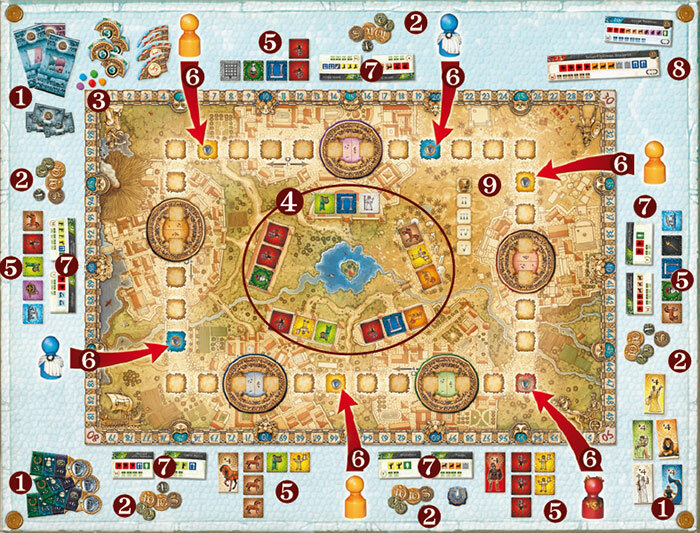 There are 5 markets, each filled with 3 Event Asset Tokens placed face up in the center of the board. These tokens are acquired by making the highest bid among the players for a particular market. The starting player for this turn points to the market she wants to bid on and makes an opening bid. The opening bid for a market must be 8 coins or more. Moving clockwise each player can now make a higher bid. The bidding continues until all but one of the players pass. If a player steps out of the bidding round, she cannot rejoin the bidding for that market. The winner of the auction pays the bank her winning bid and places the 3 Event Asset Tokens from the market face up in front of her. Having won an auction, she can no longer participate in subsequent bidding rounds this turn. New auctions are held, using the same mechanism, until every player has had a chance to initiate a bidding round for that turn. If the winner of the bid is the active player (i.e. the one who initiated the bidding), new Asset Tokens are placed on the empty market(s) before the next player initiates a bid. Always draw any remaining green backed token first and then draw replacement tokens from the bag containing orange backed tokens, placing them face up in the markets. 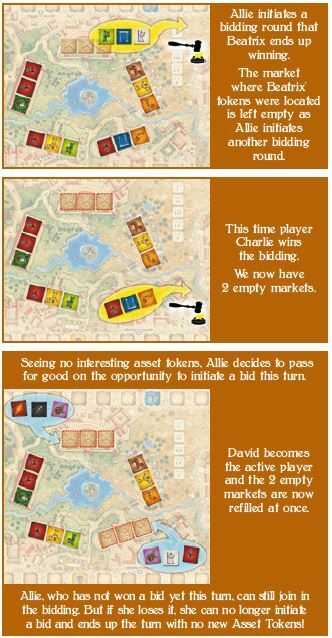 Once the tokens are replaced a new round of bidding begins with the player to the left of the starting player initiating the bid. If the winner of the bid is not the active player, the tokens are not replaced until the active player wins another bidding round this turn, or chooses to pass on her opportunity to initiate a bid. Note: Participating in an auction is never mandatory. A player can pass on her opportunity to initiate a bid. In this case although she can still join bidding rounds initiated by other players, she has lost her opportunity to initiate a bid for the rest of this turn. 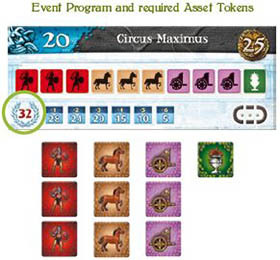 During the game a player may acquire Event Asset Tokens that they don't find useful. During this phase players have a chance to trade their unwanted Asset Tokens. The starting player begins by making open offers to the rest of the players. The player can buy, sell or exchange components with any of the other players. Only money and event assets can be used to make trades and all trades must be delivered immediately. No trades can be based on future promises. Once the starting player is done trading, the next player (moving clockwise around the table) may initiate any trades that she wants to make. This phase ends when every playerhas finished trading. Non-active players can only trade with the active player, not among each other. Depending on the willingness or reluctance of players to trade, it is possible that no trades may actually occur during this phase. In this phase, each player, beginning with the starting player that turn, may now produce an event. There are 3 steps to each event's production. Before producing an event each player will attempt to move the Nobles into her Arena. Each of these Nobles brings with him additional spectators. The Emperor brings 7 additional spectators; the Consuls, 5 each; and the Senators, 3 each. Noble movement is determined by the roll of one or two special dice. 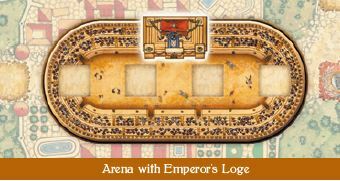 If your arena does not yet have an Emperor's Loge, you roll only one die. Once you have added an Emperor's Loge, you roll two dice. For each die rolled you must move one of the Nobles in a clockwise direction the specific number of squares indicated on the die. If you roll the 1-3 face of the die, you can move any one Noble either 1,2 or 3 squares forward. A player rolling two dice may choose to move either two different Nobles - one for each die rolled, or can move one Noble once using the sum of both dice. If a Noble ends his movement on a resting areathe player earns 1 Emperor Medal. If a player combines two dice to move the same Noble the Emperor Medal is collected only if the Noble finishes his journey on the resting area, not if he merely pauses on one midway through his movement. It is possible to have multiple Nobles on the same square. Choosing only from the Event Programs in your possession, announce to the other players the name of the event that you want to produce. Place the Event Program in front of you, so that everyone can see it. You can only present one event per turn. Because some events require arenas of a certain size, first check that your arena is large enough to run the event. Now display the Event Asset Tokens you have that are needed to produce the event. You do not need all the assets listed on the program to produce the event, but your score will be reduced for each asset that is missing. Also you must have a minimum number of assets (the least amount listed on the program that still gives you a score) to produce it. Note: You can produce an event that you already presented during a previous game turn. However when you produce a new event, each previously produced Event Program is turned face down and contributes 5 additional spectators to the new event. Now you are ready to calculate the number of spectators your event has attracted. Each Event Program has the potential to attract a specific number of spectators. This number is displayed on the program in the lower left corner. More spectacular events will draw larger numbers of spectators. However, each Event Asset token that is missing when you run your event will reduce your attendance. You will only score the full number of spectators if all assets are available. If this is not your first Event, each previously produced Event Program is turned face down and counts for 5 additional spectators. You may only add these spectators if an Asset Token of the same type as your Star Performer is used in the performed event. Add 3 Spectators for each Podium you have earned in previous turns. If you have one or more Emperor Medals, you may turn them in to attract an additional 3 Spectators per medal. The medals are then discarded. 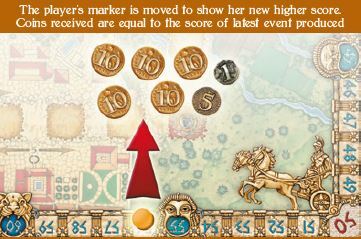 Once the event is finished and the spectators counted, if a player's score is higher than any of her previous turn's scores, her scoring marker is moved to the new higher position on the scoring track matching the number of spectators this event attracted. If the event attracted fewer or the same number of spectators than her previous high score, the scoring marker stays in place, as it should always represent the highest score for anyof her events. You then receive coins from the bank equal to the number of spectators that attended the event you produced during this current turn. At the end of each turn, except the last one, the player who has the highest overall score in the game receives a Podium and places it in her arena. The winner might not be the player who attracts the most spectators in the current turn, but is the one who has received the highest score since the beginning of the game. If there is a tie the richest player wins the podium. If there is also a tie for most money, the tied players must roll the two dice with the player rolling the highest total number winning the Podium for this turn. An event is demanding on the men, animals and resources used to present it. It is inevitable that some will no longer be able to perform. At the end of every turn, each player must discard 1of the Event Asset Tokens used in their latest event and remove it from the game. At the end of the turn, the player who is in last position on the scoring track asks the player who just received the Podium to donate one of his Asset Tokens to her by stating which type of Asset token she would like. She cannot ask for any Special tokens such as the Additional Action, Emperor or Joker tokens. If there is a tie for last place, the poorest player receives the donation. If there is still a tie, the tied players must roll the dice until a clear winner is decided. Note: No Closing Ceremony occurs after the final turn. The game ends when each player has had a chance to produce an event in the fifth and final turn of the game. The winner is the player who has attracted the most spectators to one of her events during the game. If two players are tied, the richest player wins. If players are still tied, the one who holds the most Star Performer Awards wins. Each Podium will bring 3 additional spectators to any subsequent events performed by the player who receives the Podium.